The Tony's Plate Calculator is an online tool that can help you calculate the nutritional values for a single item, an entire recipe or a full day's worth of food. If you just want to look up the nutrition for a single item, you can perform a Quick Search. 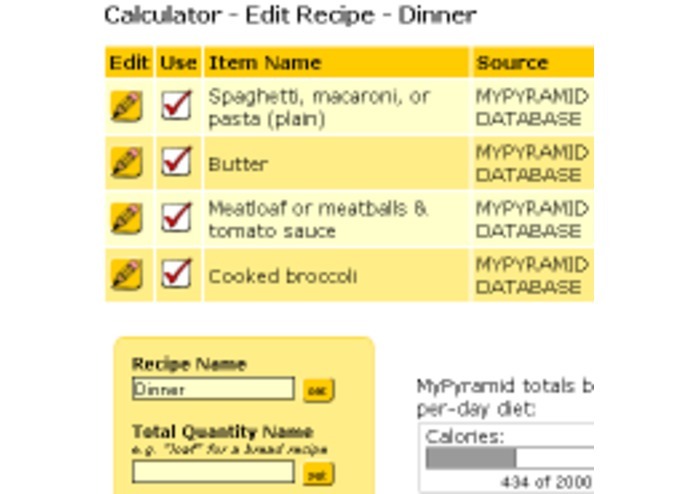 The Calculator will then present you with search results from both the MyPyramid database (which can let you know what food groups you are eating) and the USDA's Nutrient Database (which can give you information like you would find on a Nutrition Facts label). But if you want to know more than the nutrition values for a single item, if you want to look at an entire recipe or an entire day, the Tony's Plate Calculator can do that too. By combining multiple ingredients into a recipe, you can find out the totals for the recipe and the nutrition values for servings of that recipe. Those servings can go into recipes for meals. And those recipes for meals can be combined into the recipes for what was eaten in an entire day. The Tony's Plate Calculator is a powerful, flexible tool to let you know what is going onto your plate.